VietNamNet Bridge - The investment rate in solar power systems is now just equal to 20-30 percent of the rate of 10 years ago. According to the Electricity of Vietnam (EVN), Vietnam has about 30 solar power projects, a figure which, according to Le Chi Hiep, chair of the Institute of Sustainable Energy Research, an arm of the HCMC National University, is modest compared with Vietnam’s great potential in solar energy. In Vietnam, solar power began in 1990 and significant development has occurred since 1999. Many families have used solar power to heat water. HCMC University of Technology has installed many solar panels in the last 2-3 years. However, the proportion of solar power works is still modest in comparison with power from fossil fuels. In an effort to increase the number of solar power works, EVN recently committed to buy electricity from households’ solar power works at VND2,000 per kwh. If the state can show people the benefits when investing in solar power, they will pour money into solar power. The benefits include easy connections to the national grid, and open and transparent procedures for selling and buying electricity. Hiep said that the core issue in developing solar power lies in economic benefits, not in technological solutions. Therefore, the state needs to create an open and competitive market for investors to develop solar power projects. 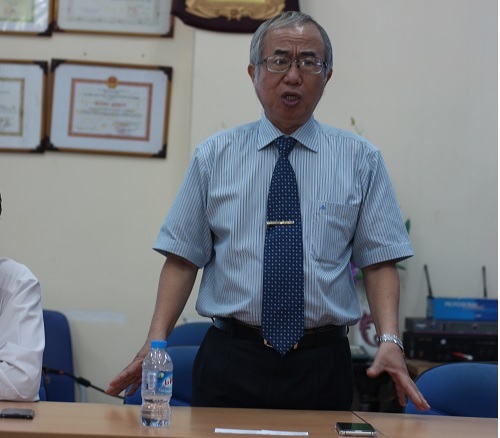 “The price of VND2,000 per kwh is not attractive enough to investors,” Hiep said. “I have met investors who show interest in the pricing policy, but they are still hesitant,” he said, adding that besides the pricing policy, the state should apply other policies on tax and land incentives to attract investors. Solar and wind power are the most feasible solutions for renewable energy in Vietnam. Thermal power causes consequences to the environment even if power plants use the most advanced technology. Vietnam has been advised to reduce the development of hydropower because it is a double-edged knife. Hydropower plants have excess water in the rainy season and have to discharge water, thus affecting people’s lives. Biomass energy has been encouraged. However, some ethanol plants have had to shut down because of problems in supply and demand. Meanwhile, there are favorable conditions to develop solar and wind power. However, the solar power projects that have been developed are small scale and the country lacks large power generation stations which use solar energy. Hiep emphasized that high costs are no longer a problem for those who want to develop solar power, because the investment rate has fallen by 70-80 percent.